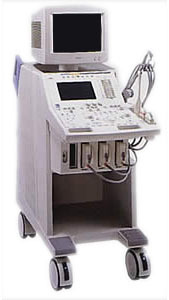 Known for its unique ability to provide a lot of power without the high price tag associated with some of its contemporaries, the Toshiba PowerVision 6000 is a workhorse ultrasound system. Featuring a large, 15-inch high-resolution monitor that offers touchscreen control, a 256 channel digital QUAD signal processing, and color doppler, operators can take advantage of exceptionally clear, quality images that aim to increase diagnostic accuracy and confidence. With the combination of these technologies, the Toshiba PowerVision 6000 ultrasound is suited for a wide range of clinical applications, including cardiac, vascular, abdominal, OB/GYN, small parts, TEE, and pediatric.